Low, economical use rate of 1 to 4 pints per acre. Controls many broadleaf weeds ; woody plants Use in turf, pastures, rangeland, ditch banks, fences... CONTAINS: 3.8 lbs. per gallon 2, 4-D acid equivalent liquid concentrate in a low volatile amine form. 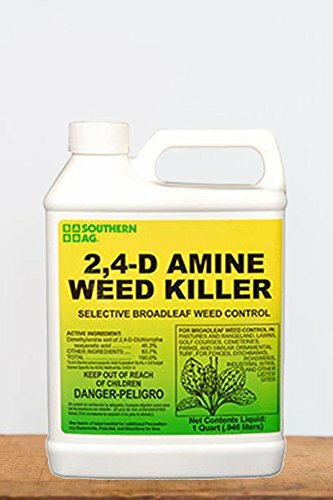 USE ON: Certain grasses in lawns, parks, golf courses, and pastures; fences, ditch banks, non-crop sites, small grains, and corn (pre and post emergent herbicide) CONTROLS: Many broad-leaf weeds. See list on label. RATE: 2- 3 tablespoons in 3 - 5 gallons of water to cover 1,000 sq. ft. APPLICATION: Apply as a coarse low pressure spray, preferably with fan type nozzle. CAUTION: SPRAY TO ACCURATELY OBTAIN INDICATED COVERAGE WITHOUT OVERLAP. AVOID DRIFT TO SUSCEPTIBLE PLANTS. INFO ; GUIDES Download Label Download Safety Data Sheet (SDS) You will need Adobe Acrobat Reader to view PDF documents. Download a free copy from the Adobe Web site.